Shyster is the nom de guerre of Craig Calcaterra. Craig is a lawyer, writer, baseball fan, husband, and father (not necessarily in that order) from Columbus, Ohio. From 2001 until 2003, Craig was the author of Chin Music, a decidedly unoriginally-named baseball column in the now-defunct Bull Magazine. 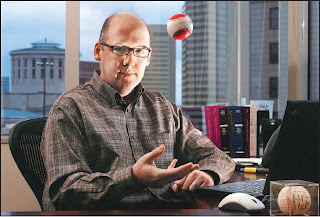 After taking a couple years off to have kids and pay attention to his legal career, Craig got his priorities back in order in early 2007 and began blogging about baseball again. Since then, Craig has written stuff of varying levels of quality for the New York Post, the Columbus Dispatch, The Hardball Times, and Baseball Analysts. Beginning in December 2008, ShysterBall can be found on the esteemed pages of The Hardball Times.